Get ready for Real Cricket Go Cricket game for your android and Ios devices. 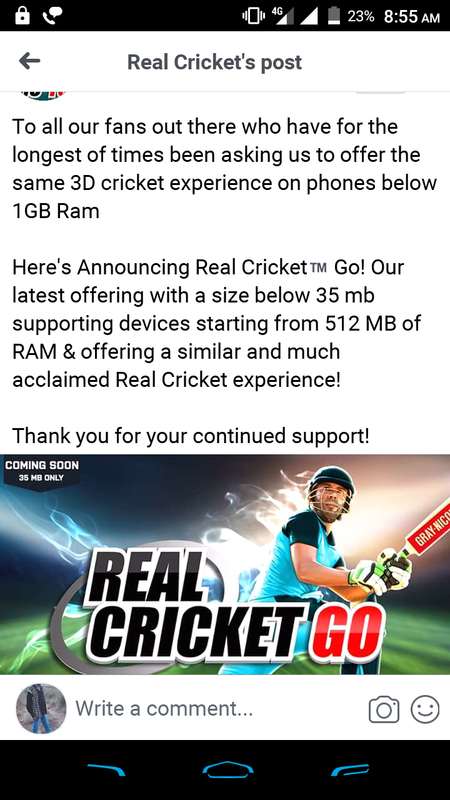 Cricket game that runs 1GB and below ram devices. We all play many cricket games on our android and ios devices. The most famous game like World Cricket Championship 2, World Cricket Battle and Real Cricket 18 is the most famous and high-quality graphics game on our Android devices. But sometimes we thought the cricket game that we have played it will run on 1GB ram or not because most of the people still using 1GB ram devices. That's why Nextwave Multimedia already launched his WCC2 lite version for those who are enabled to play WCC2. That's why Nautilus Company also brings his Real Cricket 18 lite version very soon. But company till now not confirmed the release of this game. 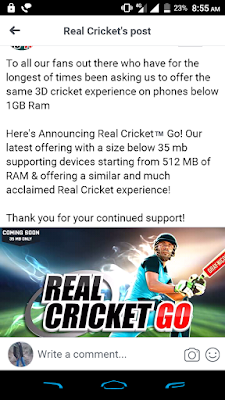 The lite version of Real Cricket 18 Game name is Real Cricket Go. That we all are seen the name on the image that we provide already in this article. 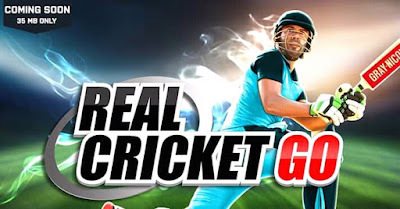 After seen this image we confirmed that the game name is Real Cricket Go. After that, we see left side the upright corner that written Coming Soon and game size is only 35MB. It clearly indicates that this is the lite version of Real Cricket 18. No other details provided in that image. But when you visit the official Facebook page of Real Cricket 18 you get more details about this game. When you read this information in this image. We all clear that this lite version of Real Cricket 18 cricket game launched very soon. And the most important thing is this game 3D based game. That is the most important part of the game. Hope Nautilus company launch this game very soon. The company does not reveal any information about this game. If this game launched then tell us what are the features that we expect in this game? Thanks For Reading If You Have Any Question Then Let Us Know In The Comment Box. And Share This Article With Your Friends. Bro its already written a article on released date topic. If you not read that then i will tell you its 14 jan 2019 may be launched beta version. According To The Report Real Cricket Go Beta Version Launched On 14 January 2019.